A firm which acts as an intermediary between landlords and tenants has been criticised for charging some customers £25 for a phone call or £15 for emails. 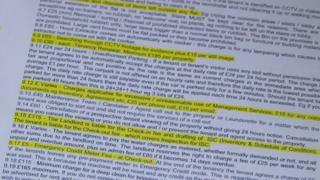 Landlord Support Alliance Bristol (LSA) insist their charges were "legal, upfront and clear". In the contract it says LSA can bill for "an excessive or unreasonable" use of their services. John Gallagher, from Shelter, says most of these charges will be unlawful when the Tenants Fees [Act] bill comes in. Mr Gallagher, who is principal solicitor for the homeless charity, Shelter, said these are fees which are set in advance and "bear no relation to the actual work involved". "Most will be unlawful when the Tenants Fees [Act] bill comes in and this will save renters a great deal of money. "At present it's almost like a licence to print money in terms of what agents can do." Ellie, is one of several former tenants the BBC has spoken to, but asked the corporation not to use her surname or picture online. She told a joint investigation by the BBC and Epigram, the University of Bristol's student newspaper: "We felt a bit stupid looking back on it, after signing up to that tenancy agreement. "At the time, you don't think they'll really apply to you. It's only when you're living there that you realise they have done all these little clauses." LSA said the tenancy agreement is used by "thousands of landlords" except the part about charges, which it says "are legal, clear and upfront". Nobody that the joint investigation had spoken to had ever met their landlord, and said they had dealt with LSA through email. In response LSA said it provided "outstanding service, had a superb track record with hundreds of tenants and fostered a culture of goodwill and fairness". Audio Letting agent admin fees - why the high cost?